High Peaks Pure Earth is posting the English translation of a blogpost by Woeser written and posted on her blog on the second day of Tibetan New Year, February 23, 2012. The post was translated into English by Elliot Sperling and has also been posted on Woeser’s blog earlier today. In this blogpost, Woeser focuses on those elderly Tibetans who travelled to India to receive Kalachakra teachings from the Dalai Lama and then returned to Tibet. The detention of returning Tibetans was covered by human rights organisations and in turn also the media. 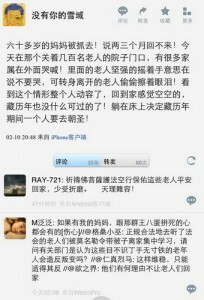 However, in this post, Woeser brings out personal stories via Tibetans on Weibo, the microblogging platform from Sina. This year, from January 1-10, at the Indian Buddhist holy site of Bodhgaya, the sacred place of Vajrasana where Buddha attained enlightenment, His Holiness the Dalai Lama presided over the 32nd Kalachakra Initiation. Approximately 500,000 Buddhists from all over the world participated, among them upwards of 10,000 Tibetan believers from all of the regions within Tibet as well as upwards of 1,000 Chinese and other believers from all over China. When the initiation was concluded the faithful from inside Tibet dispersed and set out on the return journey to their homes there. They had worn themselves out just to get passports and their route had been plagued with hardship, until finally they obtained the nourishing nectar of the buddha dharma at the holy site. They had a brief moment of happiness, never imagining that there would be a later “settling of scores;” that this would set in motion an experience of mental and physical torment. It is understood that many of the faithful whose homes were in Amdo and Kham were taken as a group to Lhasa and sent together via the Qinghai-Tibet Railway to their individual regions. Afterwards each individual had to be vouched for by two cadres in their home areas. Only then could they return to their own families. In addition, the faithful from Amdo and Kham who have returned most recently from India and Nepal were placed under uniform supervision and sent to Shigatse to receive 7 days of “education.” Afterwards they were sent back home together. And Lhasa: any Tibetans who attended the initiation encountered even bigger troubles. Of these, the overwhelming majority was elderly: retired cadres as well as urban residents and farmers from the outskirts of the city. And there were also middle-aged and young people. First they were summoned by their local neighbourhood committees or work units jointly with the relevant police station. Every person was interrogated by staff people from the neighbourhood committees or work units together with Public Security Bureau police. The important questions included: Whom did you see at the Kalacakra Inititation? What did the Dalai Lama, Samdhong Rinpoche and the newly-elected Kalon Tripa say exactly? Which people from here did you run into at the inititation? How much money did you give in offerings for the inititation, to the Dalai Lama and other Rinpoches? Etc., etc. It’s understood that those who returned from the Buddhist pilgrimage in India and were “invited to have tea” — i.e., summoned — have all had their passports confiscated. @ 木雅公主后人： I heard my relatives say that yesterday Lhasa’s winter winds were severe and the sky was ashen. Yesterday morning Amala was ordered to go. At noon she came to get a quilt and has not returned since. We recognize that they’re not happy that she went on pilgrimage to India. Should she have to study so long? And she doesn’t even understand written Chinese. @旺秀才丹： In Lhasa an old lady over 80 was put in together with Amala to study. At the Kirey police station alone they sent out three minibuses yesterday afternoon. It’s said that the time period will be twenty days. 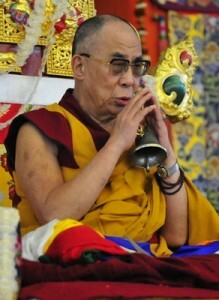 I understand the sensitivity and pressure regarding preserving stability in Tibet. I just hope they don’t mistreat, beat or abuse these old people who believe in Buddhism. Amala’s doesn’t really understand Chinese and she can’t read it. I hope she just has to attend classes and study provisions of the state’s laws on nationality policy. @木雅公主后人： Amala is a housewife; she can’t read Chinese. Her children are all married. Ordinarily she’ll do her Buddhist prostrations, play some mahjong, and that’s it. I’ve heard that they’ve been gathered at the barracks of the border defence instructional team in the western suburbs of Lhasa. Today is already the second day and she still hasn’t come home. For how long must the torment go on? Don’t torment yet again the heart and flesh of the elderly! @木雅公主后人： I pray for our compatriots who won’t be able to sleep in their own homes tonight; who will long for their families. May Buddha bless and protect the innocent ordinary people so that they may soon return safe and sound to their families; especially our elderly 80-year-old Amala. All of us are waiting for all of you to return. @旺秀才丹： Is there any law that one can rely on? What should one call a 24-hour detention? And when it goes on longer, what should one call that? @木雅公主后人： Late the second night the weather soundlessly turned very windy. All the Amalas must be very cold. Your children must bear the unbearable and let you continue to suffer! 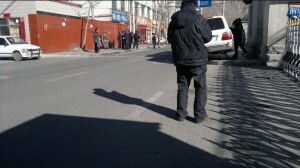 @云那边： Let’s go over it again, for the sake of those elderly people far off in Lhasa who have disappeared for no reason. When those old people left the country all the formalities were legally in order. I imagine that before they left the relevant departments naturally knew everything about them as well. But why wait for them to return for this later settling of scores, interrogating them one-by-one? Are the tactics employed to preserve stability always going to be so insidious and unpopular? @格桑小巫： As for the elderly people who went to attend the initiation in normal compliance with the laws and who have, by some unspecified order, had to grab a quilt, leave their families and be gathered together for study, I’d like to ask if the relevant departments think these illiterate, unarmed old people are capable of rising in revolt against the state? @没有你的雪域：Our mother, who’s in her 60’s, was arrested! They say she won’t return for 2-3 months! Today at the gate of the compound where they were holding several hundred old people many family members were outside crying. The old people inside were vigorously waving their hands, the idea being to tell them not to cry. The elderly who were able to turn around and leave discreetly wiped away tears! Everyone watching the scene was moved; we returned home feeling empty, with no Tibetan New Year to celebrate! We decided that over the course of the Tibetan year one family member would make a pilgrimage to a sacred site! 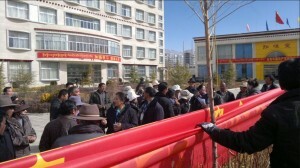 Based on the Weibo posts above and based on reliable information, at least seven or eight of these “study groups” have been set up in Lhasa alone. Some have been set up in military barracks, such as the barracks for the border defence instructional team in the western suburbs of Lhasa. Some have been set up at work units, such as the Chengguan District Teacher Training Centre below Drepung Monastery in Lhasa’s western suburbs. Some have been set up in hotels, such as those on Sera Road and Jiangsu Road. Some have even been set up in Chushul County and Toelung Dechen County, where political prisoners are confined. It’s reported that there may be up to a thousand Tibetans who attended the initiation now shut up in “study groups.” This exerts tremendous pressure upon the emotions of their families and their neighbours as well as causing them deep fears. And this is the situation in Lhasa alone. The situation in other parts of the TAR is still unclear. And the situation in the Tibetan areas spread over the provinces of Gansu, Qinghai, Sichuan and Yunnan is also still unclear. It’s been reported that the “study” component of the “study groups” includes “patriotic education,” “education about the laws,” state religious policy, etc. It has even reached the point where the 1960s propaganda film “Serf”, along with many other films that make one recall past bitterness and think of present happiness, was screened in order to expose the darkness of “Old Tibet” and extol the happiness of “New Tibet,” etc. At the same time people have had to meet certain benchmarks: they’ve had to publicly report what they themselves have gained from “study,” expounding on how their thinking has been affected by it, comparing the old and the new, “recalling past bitterness and thinking of present happiness,” and showing gratitude for the kindness of the party. Most importantly they undergo continuous questioning. This is how they “study.” And it’s rendered many of the elderly, who experienced the “Cultural Revolution” and other political movements unable to bear up under it, to the point of falling ill. Because the number of elderly succumbing to illness has gradually grown, perhaps, fearing something unforeseen happening, those among the elderly who have fallen ill have been allowed hospitalization and treatment. But they are only allowed to be treated in the Tibet Military District General Hospital or the Public Security Bureau Hospital, where plainclothes personnel keep watch outside the wards. However, visits from friends and relatives are permitted and family members are allowed to stay over. I have heard that one seriously ill elderly person has already died as a result of being reduced to a depressed mental state.